Artifacts are storytellers. They connect us - to our past, to long-gone strangers whom we’ve never met, to each other, and even to ourselves. To study an artifact is powerful and necessary. It is a responsibility that we have as human beings - and as drummers and percussionists - to preserve the stories of our craft and to preserve the names, faces, and teachings of those who came before us. Aaron and I find inspiration in those stories, which is part of the reason why we so enjoy taking the time to help protect that history and discover new editions of it, no matter how small. This is the story of one small artifact: a roughly 5"x7" glass negative found (in its digital file form) in the Library of Congress Prints & Photographs online database. It is one of about 70,000 glass and film negatives given to the Library in 1955 by the Harris & Ewing photography studio of Washington, D.C. When this particular negative was digitized, Library staff gave it a simple title (“Drummers”) based on the only information they could gather from the content of the photo itself - that four of the five men pictured were carrying drums. There was no accompanying title or caption and the smallest date range they could gather was that it was taken between 1923–1929 (based on other nearby negatives in the collection). Immediately, this image fascinated me. Clearly there was a reason this moment was captured. I had to know what that reason was and why that reason didn’t already travel with this negative. As always, discovery begins with questions. And I had a ton of questions. 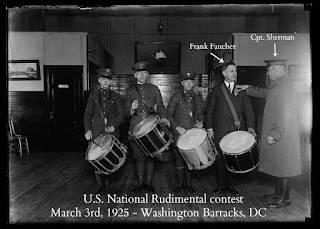 With some logical reasoning and a little bit of research, I was able to determine that the man receiving the award in the image was the one and only Frank S. Fancher: renowned rudimental snare drummer, legendary record-breaker, and all-around badass boundary pusher. I began my research on the guess that the non-uniformed man had to be a relatively “big name” in rudimental drumming during the 1920s. 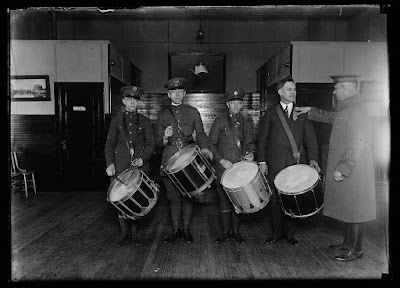 I knew that there were several powerhouse drummers during the ‘20s who would regularly compete in drum corps contests held at American Legion posts all around the country and that rudimental drumming, and these contests, still had close ties to the military. After all, during the first two decades of the 20th century, the snare drum in America was just starting to see a shift from the battlefield to the concert hall. 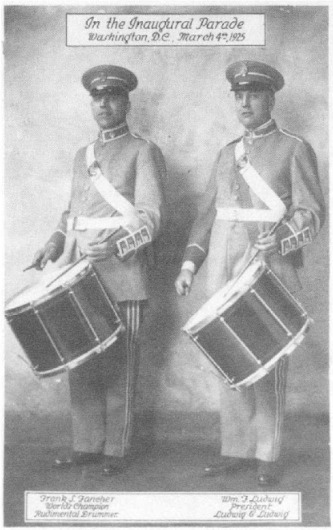 Many of the most notable rudimental drum instructors during this era were veterans of the Spanish-American war. Some of the greatest and most important names in drumming flourished during the ’20s: J. Burns Moore, Sanford Moeller, Dan English to name just a few. William F. Ludwig’s drum company was still just becoming a household name in the percussion community. Wait. There it was. Drum companies in the 20s were just starting to collect endorsers - the best players they could get - and where else to advertise their endorsements but in their catalogs? So off I went (one tab over in my browser) to drumarchive.com. [Sidebar: If you haven’t been to drumarchive.com, you really need to go there. Right now. It’s amazing.] Anyway, I figured I would start with Ludwig, the biggest name in drums at the time (and the company most contracted by the U.S. government to manufacture service drums). I scrolled through a few catalogs - 1922, nope…1923, no endorsers in that one either…1924, nothing. Finally, as I’m scrolling through the 1927 catalog - debating whether I’m even going in the right direction at all - there he is. 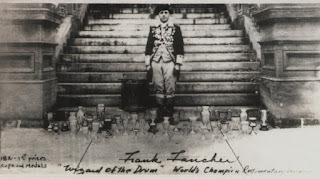 Frank S. Fancher. And he’s wearing a badge in this photo - an identical badge to the one being bestowed upon him in the LOC negative. 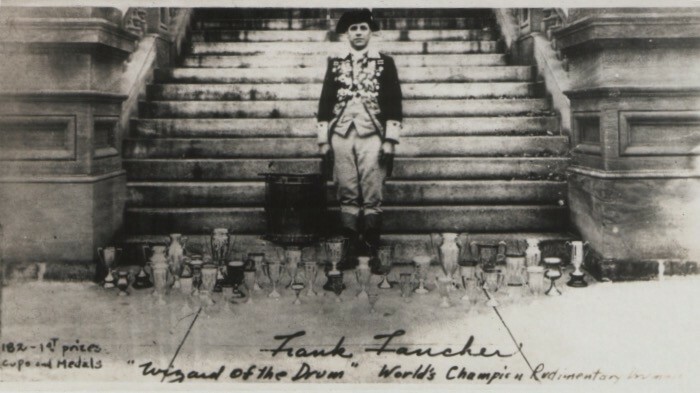 Frank S. Fancher, World’s Champion snare drummer, making an appearance in the 1927 Ludwig catalog. This headshot was likely taken on the same day as the Harris & Ewing negative. So I had a name, and from there I was able to finish the story. Fancher’s name appeared in a few Ludwig company histories (and one Slingerland history). There were a couple web pages about his relationship with drum craftsman Odell M. Chapman and Fancher’s time with Chapman’s Continental Drum Corps of Willimantic, CT. I found the obituaries published in a 1966 issue of the Bridgeport Telegram newspaper and learned that Fancher, “a champion drummer many years ago”, died on Tuesday, February 1st, 1966 - less than a month after his friend, Odell Chapman, passed away at his home in Newport. I learned that Fancher’s drum - the one crafted by Chapman himself - lives on at the Company of Fifers and Drummers Museum in Ivoryton, CT. The postcard in question. An artifact that helps to tell its own story. So there you have it. One story told by one small artifact. And though this story is but a pinpoint in a much larger and more illustrative narrative, it still matters. It mattered to Frank Fancher. It matters to me. And I’m sure it means something to anybody who has ever held a pair of snare drum sticks and felt the weight of a drum on their shoulders, or heard the sound of their instrument resonate through the concert hall, surrounded by other musicians who love their craft. What we’ve learned (so far). We have a date, location, event, and a couple names. Unfortunately the Sergeant First Class, Corporal, and Private remain unidentified. Since it seems that they aren’t Army bandsmen (judging by their cap and collar insignia) it will be much harder to identify them, but we are currently trying to find more information on the results of the 1925 U.S. National rudimental contest. If you have any information at all, please let us know. But that negative could just as easily have been destroyed. Just like so many one-of-a-kind, hand-crafted snare drums that were thrown away by unknowing grandchildren of Civil War veterans. Or beautiful, hundred-year-old tambourines - with another hundred years of life left in them, at least - that are “upcycled” into primitive wall decorations, never to see a concert hall again. We all collectively, as percussionists, need to preserve these artifacts and the stories they carry with them. So go explore and go discover and cherish each detail you find. Find the missing pieces of our past and bring them to light. Share them with each other and pass them on to our future generation. And remember that one day, an artifact will tell your story, too.